For months, Ottawa Senators general manager Pierre Dorion has insisted he won't trade Erik Karlsson or Mark Stone. But Dorion finally acknowledged on Thursday that his team might miss the playoffs and that he's had conversations with rival GMs about making deals. Although he still calls re-signing Karlsson a priority, he also can't walk away from an outstanding deal. "We have to be realistic, if we're not going to make the playoffs we're going to have to make changes," Dorion said ahead of Ottawa's game against the St. Louis Blues. "We're going to be really smart about how we go about things. We have a plan for whatever situation we're in and at that point and time we'll test that and make sure we make the right decision for this organization." The Senators (15-18-9) sit 12 points back of the Pittsburgh Penguins for the last wild card spot in the East and 15 points back of the third-place Toronto Maple Leafs in the Atlantic Division. Dorion remains optimistic but knows that it will take an incredible run to make the post-season. While Dorion has been speaking with other GMs, up to this point he's always said Karlsson and Stone were untouchable, but Thursday admitted he would have to at least consider a solid offer for the captain. "Our first priority with Erik [Karlsson] is to sign him," said Dorion. "He's a special player. If a team offers you an offer you can't turn down you listen, but our first priority is to sign Erik Karlsson and Erik Karlsson to be a Senator for life." 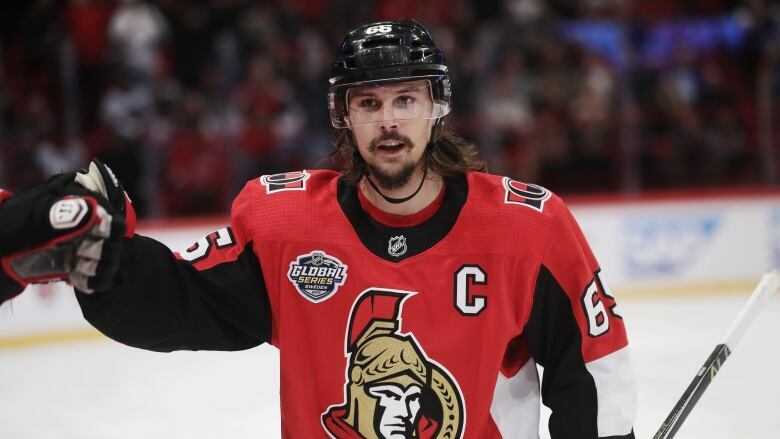 Karlsson has one year remaining on his contract before becoming an unrestricted free agent and the Senators would likely want a new deal in place before the start of next season. But Dorion knows he needs to at least listen to what's out there. With the trade deadline just over a month away the Senators will need to make some decisions on their roster, but much will depend on how the Senators perform the next few weeks. "No rash decisions will be made," said Dorion. "We have to be realistic and understand our situation. If we don't make the playoffs we have to start planning for our future and that way we can take one step backwards to take two steps forwards."